Eros International and Paperdoll Entertainment’s ‘Paathshaala’ that hit the theatres today has done well on its opening day. Starring Nana Patekar, Shahid Kapoor and Ayesha Takia, Paathshaala has received a favorable opening and has succeeded in pulling audiences to the theatres. The movie received a grand opening all over India. Jaipur, Jodhpur, Udaipur started with 40-50 percent which has gone higher in subsequent shows. In Hyderabad, Punjab and Indore too it opened to 50-60 percent and is expected to go up show wise. In Mumbai city also Cinemax, Fun Republic and Fame Adlabs received a good turnover on the opening day. Bigg Boss - 3 : Vindu wins all, winner & boldest contestant prize ! Vindu is the Bigg Boss 3 Winner. Vindu Dara Singh son of Dara Singh is the winner of Bigg Boss 3. The grand finale was held today at Lonavala. He was selected by the vote of 'desh' as he says. It is Desh Ka Adesh ! Vindu will be awarded with a prize money of Rs.1 crore. The ultimate decision was announced in the presence Bollywood megastar Amitabh Bachchan who has been hosting the current session. Vindu also won a Chevrolet Cruze car as being the boldest and stylish contestant in Bigg Boss -3 ! 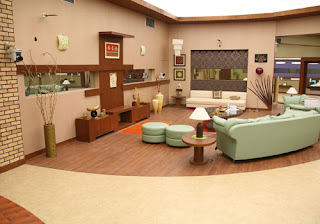 Competition is tough among last three left out in Bigg Boss-3, this season. All three can make it big. But rumours are abuzz that Poonam will emerge as the winner. 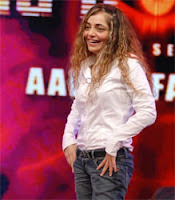 If she wins she will be the first female contestant who will win Bigg Boss. She will get Rs 1 cr as winning amount. It is still to be guessed who gets the car ! 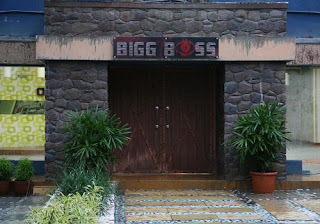 The last day of Bigg Boss Season 3. Total 3 are left out contestants (Vindu Dara Singh, Poonam Dhillion and Pravesh Rana) out of which one will win the contest & get the total amount of Rs one croreIf we see the previous episodes of the show then we’ll find that both of the event has given us male winners as Rahul Roy & Ashutosh Kaushik respectively. If it is male than the competition is little tougher for Vindu and Pravesh Rana. So will it be Poonam the first female contestant to win - Let see ! But feelers for PD are high ! 3 Idiots is not about idiots. It's about 3 engineering students who believe in doing things on their terms. That's what they achieve and that's what Hirani, Chopra, and Aamir achieve, too: making a movie on their terms ! The film is fresh and funny. Movie has opened well today. Though still early days but trade pundits are saying it is going to be a hit. While their are some critics which say that it falls short of Munnabhai standards, but yet an entertainer. Produced by Vinod Chopra Productions, 3 Idiots was distributed in collaboration with Reliance Big Pictures. Made on an estimated budget of Rs 35 crore, 3 Idiots has been released with 1,894 prints, of which 1,550 went to the Indian market and 344 went overseas. Sweety (Rakhi Vijan) of the comedy serial Hum Paanch was voted out of Bigg Boss - 2 the reality show which is on air at Colors TV Channel. This is the second week of the programme. Though she described her stay "Fantastic" and found Rahul Mahajan as the sweetest among all. Both Rahul and Rakhi were nominated last week by the house members last week and then it was decided by the sms poll from the people who would be evicted within the two. Interestingly all the ones evicted ones had some kind of tiff with Sambhavna Seth , another participant at the show. It was earlier Sanjay Nirupam, the politcian who was voted out last week. He had some heated debates with Sambhavna and now Rakhi. ! In this week episode the K queen Ekta Kapoor and Tusshar Kapoor made a special appearance at the Friday's show to promote their film 'C Kkompany'. Priyanka Chopra and Shahid Kapur fell off a bike while shooting for Vishal Bharadwaj's film Kaminay. The accident took place in Pune while a scene that required Priyanka to ride a bike with Shahid on the back seat was being shot. The two were riding the bike on a slope that was slightly muddy when the two-wheeler skidded and the two fell off. And to make matter worse, the bike fell on top of them. "By god's grace, I am fine and so is Shahid, except for a few cuts and bruises. I think the only thing that is seriously damaged is my ego, otherwise I am alive and kicking," Priyanka was quoted as saying in her press statement. Why sell Horlicks Darsheel ? Taare Zameen Par's Darsheel Safary is now in ad market, minting money for himself and of course will be wooing kids to make Horlicks part of their daily lives. Darsheel is Horlicks's brand ambassador. The TV ad of Horlicks will be his first TV commercial wherein he is seen as a school kid who gets infatuated with a charming classmate. In his attempt to look cool to impress the girl, he ends up making a fool of himself. As a solution, Horlicks gives him a simple and easy way to look cool. The advertisement ends with Safary successfully impressing the girls with trendy sunglasses. The sunglasses came free with 500 gm packs of butterscotch, pistachio and chocolate flavoured Horlicks. By the way Darsheel does Horlicks really do that you do in ad ? Have you be using Horlicks before you became its brand ambassador ? A question that you need to scatch your soul for its answers. You have a great image, contribute it for children of India who suffer and then you earn out of it - not a problem. Why not become brand ambassador for some children's cause ? Shah Rukh Khan will have his second wax statute coming up in France. Paris's Grevin wax museum will present King Khan's wax statue next month. This is almost a year before his wax statue was unveiled at Madame Tussauds, London. Shah Rukh will be the second Indian celebrity after Mahatma Gandhi to have a wax statue in Grevin. He will be the first Bollywood star to have two wax statues in the two most prestigious wax museums worldwide. Khan is extremely popular in France with a huge fan following and the wax statue would give Indians another reason to travel to that country, already Paris is a hot destination among Indian tourists. A 19th century French journalist Arthur Meyer conceived Grevin's wax museum. He collaborated with Alfred Grevin, a cartoonist, sculptor and costume designer to work on the project. Wax museum was open to the public in June 1882, and it became a grand success. Some of the wax statues in the Grevin collection include Mahatma Gandhi, Albert Einstein, Pope John Paul-II, Elvis Presley and Michael Jackson. It was a sprawling marriage reception of Golden Star Ganesh and Shilpa on Sunday night at the Golden SPA resorts near Bangalore. National award winning art director Shashidhar Adapa had erected a beautiful set of a Ganesh Temple near the pool side of the resort.The proceedings were colourful and every thing went on smoothly. The major attraction of the reception was the grand entry of the couple to the reception podium. Ganesh wore a pink sherwani and it ws a pink Ghagra for Shilpa and they also had some bright antique ornaments which were the cynosure of all eyes. Ganesh had an antique chain with the Anjaneya inscribed pendant. And both Ganesh and Shilpa were looking stunning. Noted film personalities, VIP's were among more than 2000 people who attended the reception. Amitabh Bachchan along with his wife Jaya Bachchan, daughter-in-law Aishwarya Rai Bachchan and Samajwadi Party leader Amar Singh visited Bhopal on Saturday to attend a marriage ceremony in the family. 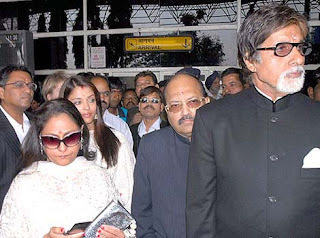 Bachchan family reached airport here from Mumbai in a special aircraft at 1100 hours to take part in the marriage of film actor Rajeev Verma's son and drove straight to the wedding spot. They returned the same day after attending the wedding. Abhishek was busy with the film shooting in Jaipur, hence could not join them in the wedding. 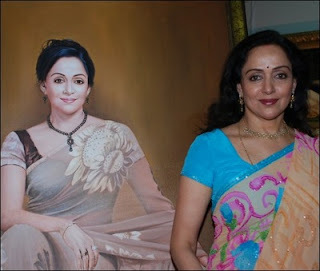 Shweta Nanda, Amitabh's daughter was already present at Bhopal for the wedding. Kambakth Ishq starring Akhsay Kumar and Kareena kapoor has also signed in the famous holloywood star Arnold Schwarzenegger also the California Governor. Akshay plays a Hollywood stuntman in the film. It is expected that the film may rope in stunts experts from Hollywood for Akshay’s stunt scenes in the film. Adding more to the entertainment, pop diva Beyonce Knowles will also feature in a track in the film. According to sources, the production work on Kambakth Ishq has already begun in LA. It is reported in media that talks are on with Sylvester Stallone and was confirmed by Sajid Nadiadwala the producer as per the media reports. Kambakth Ishq is slated to go on the floors towards the end of the month. Reportedly, the film will star a total of nine Hollywood actors and will be shot in the exotic locales of Los Angeles. Welcome movie starring Anil Kapoor, Nana Patekar, Akshay Kumar, Katrina Kaif, Paresh Rawal, Feroz Khan and Mallika Sherawat is going on at cineplex’s. It also has a special dance number by Malika Arora Khan. Though the film is based on Hollywood’s ‘Mickey Blue Eyes’, but is still interesting with Anil – Nana and Mallika doing a great one to pull the comedy in the film. Never to forget Akshay is subtle but nice, and is paired with Katrina (Namaste London pair) in the film. For me - watch the film, leave your brains behind and enjoy. Probably that is one of the reason you spend the money !!!. Welcome is directed by Anees Bazmee, produced by Feroz Nadiadwala and written by Rajiv Kaul and Praful Parekh duo. In the film story flows that Akshay and Katrina fall in love. Akshay is Rajiv in the film, nephew of Dr Ghungroo (Paresh Rawal) while Katrina is Sanjana, sister of mobsters Uday Shetty (Nana Patekar) and Majnu (Anil Kapoor). Family members of both of them i.e. Dr Ghungroo and Uday and Majnu want nice spouses, who have good name in the society. But the twist is here as the respectable doctor when Dr Ghungroo goes whacky as he comes to know that his ‘to be bahu’ is sister of these mobsters. It is here where begins the mayhem as Rajiv and Sanjana realize that they must bring the criminals to the straight path before they get married…...never to forget RDX played by Feroz Khan who is International partner of the mobsters and jumps in the fray. Welcome, is being distributed worldwide by The Indian Film Company (IFC), and as per web site information it had grossed Rs 571.8 million in its opening week. If you are you a movie buff then this research is sure to bring a smile on your face --- the presence of other people may enhance our movie-watching experiences. Researchers from University of Chicago carried out a study and explained that ''the more in sync we are with the people around us, more we like the movie,'' the Science Daily reported. They suggested that over the course of the film, movie-watchers influence one another and gradually synchronise their emotional responses. ''By mimicking expressions, people catch each other's moods leading to a shared emotional experience. That feels good to people and they attribute that good feeling to the quality of the movie,'' explain researchers Suresh Ramanathan and Ann L McGill. In a series of experiments, the researchers had participants watch a video clip. Some of the participants watched alone, some with other people whose expressions could not be seen due to the presence of a partition, and some with other people whose expressions could be seen. The participants used to indicate their feelings at each moment with the help of a joystick. The researchers found that people watching a film together appeared to evaluate the film within the same broad mood, generally tracking up or generally tracking down. In another study, the researchers videotaped participants and found that synchrony of evaluations can be traced to glances at the other person during the film and adoption of the observed expressions. The researchers explained: ''Participants who looked at each other at the same time appeared to note whether the other person's face expressed the same or different emotion than their own. Perceived congruity of expressions caused participants to stick with their current emotional expression . . . Perceived incongruity, on the other hand, led to a dampening of subsequent expressions.'' ''Social effects described above were bi-directional suggesting that such influences were mutual rather than the result of a leader-follower pattern,'' they concluded. The researchers are the first to examine how a shared experience affects not just our immediate feelings, but also our overall impressions of the experience as a whole. Bollywood filmmaker Farah Khan, who is riding high on the success of "Om Shanti Om", credits superstar Shah Rukh Khan's shirtless song-and-dance sequence as one of the main reasons for the film's good opening. "Om Shanti Om", a film on reincarnation, had a tough battle to overcome for box-office supremacy as it was sharing its opening date with "Saawariya" -- on unrequited love -- by top Bollywood filmmaker Sanjay Leela Bhansali. But three-days since its release, analysts say, "Om Shanti Om" has edged past "Saawariya”. "The entire credit for the film's success goes to Shah Rukh," director Farah Khan told Reuters over phone on Sunday. "He is the film's main attraction and the shirtless song is definitely one of the main reasons for the film's hit. It is the scene to watch out for." The bare-chested act by the 42-year-old actor who underwent rigorous training sessions to develop a six-pack, has helped the song "Dard-E-Disco" reach the top of the charts across television channels and FM radio stations. "I have made many girls and women happy by showing Shah Rukh in a very different way," she said. "He has a huge audience base and everyone I'm sure is loving the way he has pulled it off. He had to train a lot for the scene and he is looking very good." Smoking has become a symbol of elitist behaviour, especially among the college and university students. The role of cinema is crucial in this habit of the new generation as the youth smoke their way to stardom in the campus. THE HEALTH MINISTER of India would be a happy man with this film. After all, he has been urging film industry not to smoke, at least on screen. Obviously he is right. Films, advertisements and celebrities do have a strong influence. In fact, recognising their power to influence, many developmental and social organisations globally and in India are using them to help promote positive behaviour. If they smoke, they tend to promote smoking as an acceptable behaviour. Fact of the matter is that smoking kills, though silently. Just by printing pictorial and graphic warnings on the harmful effects of smoking on cigarette packets may not have a significant impact. The need is of more. As per one estimate, tobacco kills 8,00,000 Indians in a year and about four million people the world over. Estimates also tell us that approximately 1,60,000 people develop cancer each year as a result of tobacco consumption. Every year some 4.5 million Indian smokers suffer from angina or heart disease and about 3.9 million people get lung disease. The major concern is for youngsters, who get hooked on to smoking at an early age. A survey conducted among 2599 college students in Delhi shows that two per cent of the surveyed students smoked their first cigarette before attaining even 10 years of age. The survey, conducted among the students of three colleges in the capital, also revealed that 61 per cent of them smoked for the first time while they were between 16 and 20 years of age. Exposure to smoking activities, easy availability of cigarettes in educational institutions and the message of smoking getting reinforced through films are the major contributors to the problem. Thankfully, a film titled ‘No Smoking’ will hit the Indian cinema halls on October 29. Anurag Kashyap’s ‘No Smoking’ has John Abraham and Ayesha Takia in the lead roles. The film is supposed to be a surrealistic take on a smoker trying to quit the habit. Even the song tracks in the film are about the mental and physical state of the individual, who is completely dependent on smoking in spite of knowing well about its effects on his health and mind. The song, ’Jab Bhi Cigarette’ is about the bygone days as the protagonist fills his ’ash tray’ with the remains of his cigarettes. Similarly, song tracks like ’Phoonk De’ and ’Kash Laga’ are centred on the subject of the film. We will have to wait to see how this film does at cinema halls. Whatever be its fate, the effort has to be complimented. Meanwhile a good news on the same front is that the World Lung Foundation - South Asia (WLF-SA) has also begun work on a two year project to make the North Campus of Delhi University a ‘tobacco free’ area, a positive move that would help reduce smoking. The project needs to be replicated by other educational institutions in India.